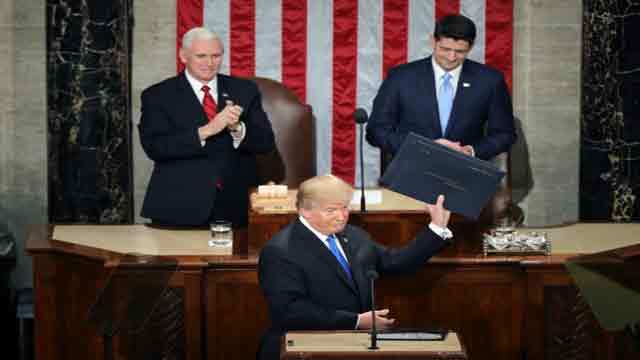 TAX CUTS AND REFORM: President Donald J. Trump has delivered comprehensive tax cuts and reform to the American people, providing taxpayers and businesses with the tax relief they need. President Trump has provided $5.5 trillion in total tax cuts to the economy, with more than $3 trillion of these cuts going to hard-working American families. The new law also includes $4 trillion in tax reforms through eliminating tax breaks and loopholes that primarily benefited wealthy taxpayers and multinational corporations. o The Council of Economic Advisers estimates that annual income for American households will increase in the long-run, on average, by $4,000. The standard deduction will nearly double so that the first $24,000 earned by a married couple will be tax free. Middle-income families will be taken out of the Alternative Minimum Tax. The Child Tax Credit has doubled to $2,000 for each child under the age of 17. The full credit will be available to single-income homes with incomes of up to $200,000 and to dual-income homes with incomes of up to $400,000. The refundable portion of the credit has increased from $1,000 per child to $1,400 per child, which means bigger refunds will be paid to many lower- and middle-income families who don’t have enough tax liability to offset the credit. Obamacare’s burdensome individual mandate has been repealed, providing immediate financial relief to Americans. By reducing the top Federal corporate tax rate from 35 to 21 percent, American businesses will keep more capital and jobs here in the United States. The significantly lower tax rate enables businesses to create jobs, boost wages, and invest in their workforce and business. S corporations, sole proprietors, and other “pass-through” businesses will also see significant tax relief, in that they will be able to deduct 20 percent of their business income. Businesses will be able to deduct 100 percent of the cost of their capital investments in the year the investment is made for the next five years. Important reforms will bring trillions of dollars of wealth back home to America. The switch from our current worldwide system to a territorial system will end the penalty imposed on companies headquartered in the United States. A one-time repatriation tax will be imposed on income that has already accumulated overseas, ending the incentive to keep the money offshore. EARLY BENEFITS FROM TAX CUTS: Across the country, companies are using President Trump’s tax cuts to invest in American workers with bonuses, higher wages, and better benefits. More than 250 companies across the country have announced bonuses, pay raises, higher retirement plan contributions, or other investments in their business or workforce. More than 3 million American workers have already benefited from a “Trump Bonus” or “Trump Pay Raise,” thanks to the Tax Cuts and Jobs Act. Some of America’s most prominent companies – including Walmart, AT&T, Disney, Starbucks, and Apple – have announced their intention to distribute some of the benefits of the Tax Cuts and Jobs Act back to their employees. AT&T plans to increase U.S. capital spending by $1 billion and provide a $1,000 special bonus to 200,000 U.S. employees. American Airlines stated that “the positive impacts of this historic tax reform” drove its decision to issue a $1,000 bonus to thousands of its employees, representing a total distribution of nearly $130 million. Disney cited tax reform as the impetus for a $1,000 cash bonus to 125,000 employees, as well as a $50 million investment in employee education. Walmart has credited tax reform with “[giving] us the opportunity to be more competitive globally,” raising starting wages, expanding parental leave, and giving many employees a bonus of up to $1,000. The combined wage and benefit changes will benefit the company’s more than one million hourly associates in the United States. REGULATORY REDUCTION: The Trump Administration is keeping its promise to cut unnecessary regulations, saving our Nation billions of dollars. The Trump Administration is eliminating overregulation at a record pace, with Federal agencies issuing 22 deregulatory actions for every 1 new regulatory action. In total, the Federal Government issued 67 deregulatory actions for FY 2017, creating only 3 new regulatory actions. Over 1,500 planned regulatory actions have been withdrawn or delayed. For FY 2018, Federal agencies have committed to cutting over $9 billion in lifetime costs, and for every 1 new regulation, at least 3 deregulatory actions will be instituted. President Trump has signed 15 Congressional Review Act resolutions – more than any other president – taking personal, direct action to reduce the burden of regulations on hardworking Americans. JUMPSTARTING THE ECONOMY: The Trump Administration’s “American Model” of pro-growth, pro-business policies has already produced results for the American people. The Dow Jones Industrial Average has closed at record highs more than 70 times under the Trump Administration, including a close at over 26,000 points for the first time in history. In 2017, the American economy experienced GDP growth of over 3 percent for two quarters in a row. More than 2 million new jobs were created during President Trump’s first year in office. The manufacturing industry created nearly 200,000 jobs in 2017, after thousands were lost in 2016. The unemployment rate is at one of its lowest points in 16 years, with African American and Hispanic unemployment rates at their lowest recorded points.